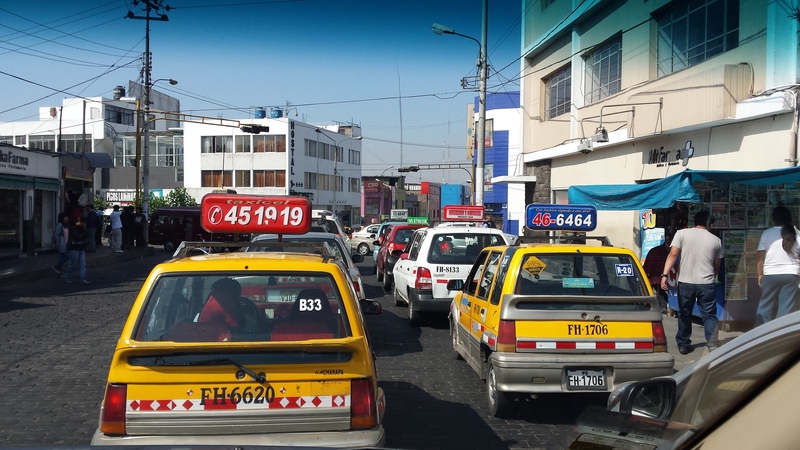 Navigating through the city of Arequipa is quite an adventure. Our hotel is located in the historic district, so walking the streets between the hotel and the main town square, La Plaza de Armas, is very easy to do. There are a number of shops, restaurants, bars, dance clubs in the area, so it would be very simple to never leave the confines of this neighborhood. But, if you want to get the true flavor of a city you have to get out to the other neighborhoods and move about like the locals do. Normally that means public transportation, and that’s where the options become really interesting. Usually when I travel the first thing I try to do is find out what public transportation is available. In most cities there is a central transportation agency that has schedules, fares, etc. But that has proven very difficult to determine here in Arequipa. 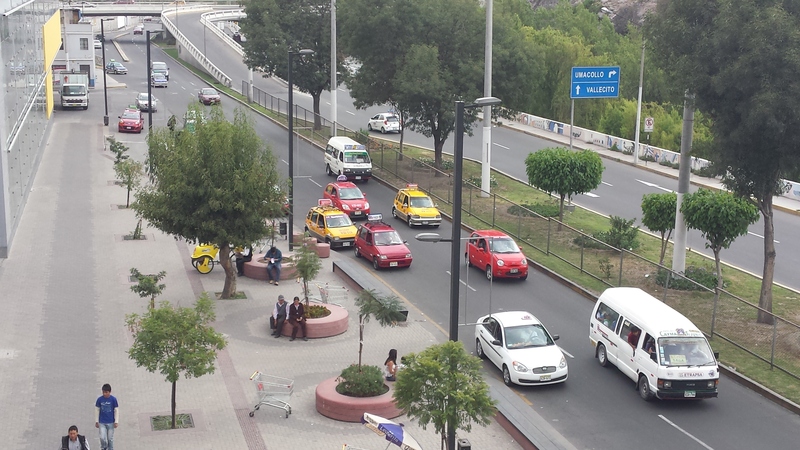 There is no major option like subway, light-rail or street car, so that basically leaves bus, taxi and private driver. For work, the NGOs have coordinated private drivers for us. They show up outside our hotel every morning at an appointed time, usually 8:30am, and then again outside the office of our NGO at the end of the work day. The drivers have all been safe, courteous and willing to change the pre-scheduled times if we need them to. I’m not sure what this type of service costs, but it is a great way to travel the city. Buses, on the other hand, have been quite a challenge. There appears to be two main types of buses that run through the city and surrounding areas. The first type appears to be nothing more than a large mini-van. People hop on and off, but there doesn’t seem to be any number or other markings on the outside of the vehicle to inform you of the destination. The second type is a bit larger and looks like a city bus, but again no external markings to determine the route. However, most of the larger type buses do have a person hanging off the door calling out the destination. Since I am unfamiliar with many of the names of the surrounding neighborhoods, it’s quite difficult to guess which direction I would be headed. And the really fun part is that both of the bus options don’t always seem to stop along the side of the road. Part of this is due to the way traffic behaves around here, which I will describe a bit further below, but suffice it to say that if you want to get on a specific bus, you sometimes have to run into the middle of traffic and jump on board while it is slowly rolling. I liken this to the concept of “hoboing” on a train, except I’m sure somewhere along the way you have to pay a fare, which after 3 weeks I have yet determine the exact amount. Now, the taxis on the other hand I have figured out. Most of the cars are marked as you would expect a taxi to be, but there are some very distinct differences in what you get for your money. We were warned that not all taxi companies are safe, and I guess I initially took that to mean that there were some unscrupulous drivers out there that would either charge you too much or maybe take the “scenic route”. What I have learned is that the dangerous situation is that they may drive you down an alley where some of their friends are waiting to jump in the car and extort money or credit cards from you. Now, I haven’t seen this first-hand, but there are many reports of such from the people who live here. My taxi experience comes more in the form of selecting the right type of vehicle. And by that I mean you have to look for the car model, how new it is, the condition of the exterior and the tires. By far the highest volume of cabs are these little yellow ones that appear to be made by either Yugo or Daewoo. 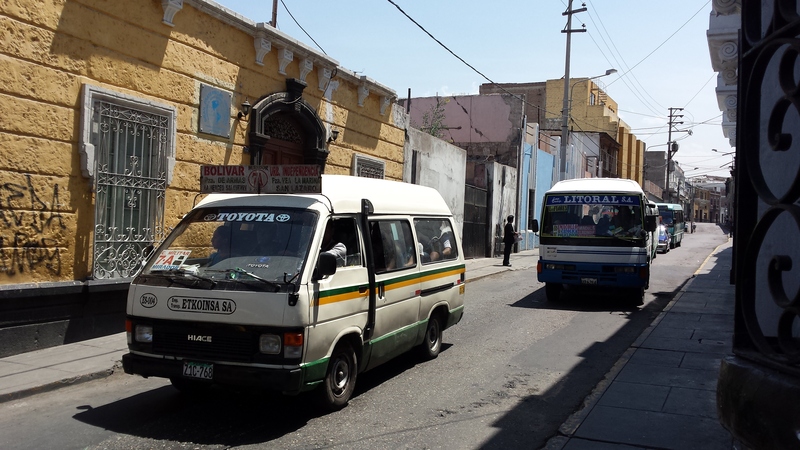 These cabs are everywhere and the locals take them without concern. But in my observations, if there is a car broken down on the side of the road it will inevitably be of this make. And I have yet to see one of these cars with anything appearing to be a safe amount of tire tread on the wheels. Now, that doesn’t mean that I haven’t ridden in one of these cabs, but I really do my best to avoid it. Finding a newer model vehicle with newer tires seems to be the best bet. But that doesn’t mean you’re safe just yet. In fact, I’m not sure there is anything resembling safe driving in this town. Now I should pause here to say that I grew up in Los Angeles California, and learned to drive on those streets and freeways. Navigating those streets always felt like a challenge, but nothing insurmountable. However, that was before I ever began to travel. 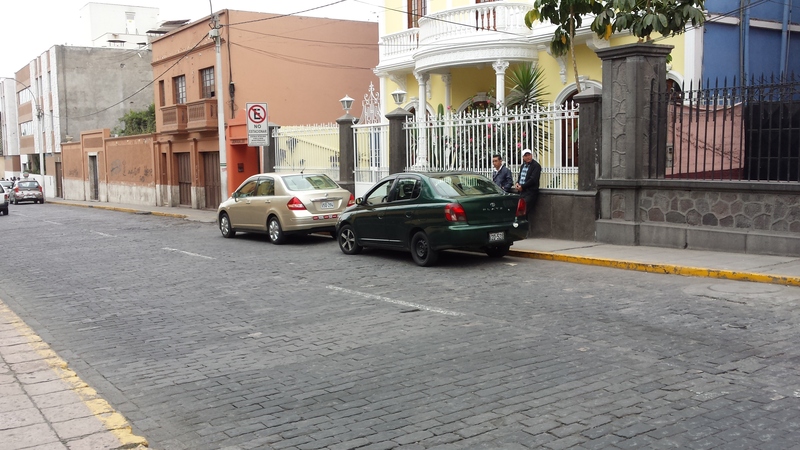 The streets of Arequipa remind me more of Rome than anywhere else. But life moves at a slightly slower pace here than in Rome. Which would seem like a good thing when it comes to traffic, but oddly I think it makes it a bit more dangerous. The drivers here seem to take more risk since they aren’t moving at such a rapid pace. Frankly, I’m not sure why they have painted the roadways with lane lines, or why they even bother to have stop signs. No one uses either, and I believe it to be a national sport to see how often you can avoid the guidance provided by the state with these traffic controls. What I have learned is that there is a group mentality to driving around here, very similar to the way schools of fish move about. Have you ever swam with a school of fish? If you have, and have been surrounded by them, you probably thought to yourself that if you moved quick enough you could touch a few of them. Then you try and they all seem to know that you were about to make that move and they stayed just outside your reach. That’s basically how the cars operate here. Four beeps = “My car is older and more damaged than your car and I don’t really care if we smash into each other so I’m gonna take that space regardless of anything else that has been communicated by horn.” And then there are some aggressive words in Spanish about Mothers, Daughters, God and other things I don’t understand, but it’s clear that 4 beeps is the maximum. If I ever hear five beeps I’m pretty sure that would be the signal for someone to call an ambulance. Fortunately, I have yet to hear five beeps, and I hope I never do. One last bit for my friends into alternative modes of transportation. Motorcycles and scooters are in use in this town, but they seem to be a pretty risky option, so it is mostly younger males that I see riding them. Bicycles are almost invisible. I have seen a couple, but only on the weekends, so that doesn’t seem to be a viable commuting option. As and for skateboards, the streets and sidewalks are so torn up that it would be impossible to ride for more than a block at a time. There is at least one skatepark that I have seen, with both street elements and what i suppose you could call a half-pipe, but I haven’t seen it in use. I have seen 3 different teenagers with skateboards, 2 street boards and 1 longboard, but none of them were being ridden at the time. They were probably more of a fashion statement than anything else.